Will Smith has a new movie coming out and it may be the highest grossing Public Service Announcement of all time. The film is called Concussion. Can you guess what it’s about? Yes, the movie is about concussions, and if NFL Commissioner Roger Goodell watched the same trailer I did, he’s probably thinking that retirement looks pretty good right about now. Will Smith plays forensic pathologist Bennet Omalu who discovered a neurodegenerative disease in the brains of football players. Omalu’s discovery was the smoking gun evidence the NFL was hoping to avoid and then quash amidst an avalanche of lawsuits from its former players. Concussions have become the injury of the millennium, and the NFL has a lot to do with that, albeit begrudgingly. It’s collection of damaged alums, combined with Dr. Omalu’s findings, have pushed the concussion conversation into the national conscience. Sports Illustrated’s 2012 piece on Jim McMahon was a whopper, detailing the human cost of a brain that’s been treated like a battering ram. HBO devoted several episodes of Real Sports to the NFL concussion controversy before releasing an episode this summer that focused on a teenage female soccer player whose life has been dramatically altered due to a concussion. And that’s what we’re beginning to understand… concussions aren’t like other injuries that get treated, healed and are never heard from again. The ‘rub some dirt on it’ philosophy doesn’t apply. A concussion can stay with you like a shadow, and it can utterly dismantle your quality of life – or, in some cases, just your life. Such was the case of Junior Seau, the NFL icon whose suicide was attributed to a career of repetitive shots to the head. Soccer stars have stepped forward to champion concussion prevention. Brandi Chastain has been a vocal proponent for eliminating heading from youth soccer for players up to fourteen-years-old. Goalkeeper Briana Scurry, who suffered a career-ending concussion, is now a concussion-prevention advocate. These days, concussions are frequently in the sports spotlight, and for good reason. Concussions hit more than four million Americans each year – and those are just the ones that get reported. Many remain undiagnosed. And it’s not just a football problem. The occurrence of concussions in soccer is remarkably high. 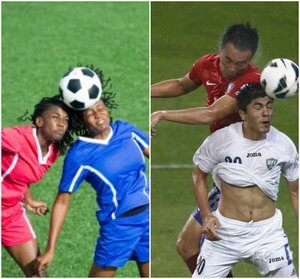 Soccer ranks only behind football in the amount of concussions sustained and it is the leading sport for concussions in females. A recent lawsuit against FIFA and US Soccer claims that in 2010, 50,000 high school soccer players suffered concussions. 50,000! To make matters worse, once you sustain your first concussion, you are two to three times as likely to sustain subsequent concussions. And when Will Smith hits theaters this Christmas, soccer moms from coast to coast are going to be rethinking the athletic endeavors of their children. And honestly, I don’t blame them. Pushing concussions into the spotlight is turning out to be a very good thing. It’s giving people the chance to make educated decisions. It’s creating technologies that will keep our kids safer. No one can be happier about the movie Concussion than Unequal Technologies, a company devoted to preventing them. Unequal is already a mainstay in the NFL and NHL, and they’ve recently moved into the soccer market with their Halo headgear. If you watched any women’s soccer this summer, a Halo is what US defender Ali Kreiger wore on her head while she was busy winning the World Cup. Mexico’s top talent, Charlyn Corral, also donned the Halo, as did a handful of others. By gearing up on the biggest stage, these stars are making protective headgear socially acceptable on the soccer scene. And oh by the way, if anyone tries to tell you that you can’t get a concussion from heading a soccer ball, they are grossly misinformed. I’ve seen it happen firsthand on multiple occasions. Okay, let me also say that at least in the realm of women’s soccer, coaches have to bear some of the blame. We haven’t done our players any favors when it comes to teaching proper heading technique. The fact of the matter is that most girls don’t know how to head a ball properly. Proper technique goes a long way to minimizing the ball-to-head impact. When it comes to technique, a player should head the ball; the ball shouldn’t head the player, and too often, that’s what happens. Proper technique is not only safer, it also makes heading a lot less painful. Incidentally, if you’re going to teach a heading session, I highly recommend using partially deflated soccer balls, or even some type of Nerf-like substitute. And if you want to make a million dollars, come up with the head-safe ball – something that looks and feels an awful lot like a regular soccer ball but is much safer for training headers. Believe me, I’ve thought about it. The opposing goalkeeper punts the ball and you’re going to challenge for it. The attacker right in front of you is also going to challenge for that ball, and she’s going to try and flick it on past you. When she does this, she’s going to snap her head backwards, right towards your face. Most players on the defensive end of this challenge do nothing to protect themselves. They simply square their shoulders to the attacker and jump straight up hoping to win the ball. Then the attacker snaps her head back and the back of her head slams into the defender’s face. It happens all – the – time. Poor body-shape has led to a whole lot of head injuries. When challenging for a punt - or any ball where the attacker is posted up in front of you - don’t go up square; go up sideways and use your arm to build a cage. Use that arm as a barrier between the attacker’s head and your face. It’s hard to explain in print, so I’m including a picture that compares reckless technique to safer technique. Notice the male player in the red jersey. You can see he’s turned sideways and is using an arm to build a protective cage. That’s what it’s supposed to look like. Unfortunately, more often than not, our players seem to model the torpedo technique from the other photo. Watch an EPL game this weekend. You’ll see players regularly employing this safer technique. Why? To protect themselves! For the welfare of our players, coaches need to learn to teach this method of challenging for headers. It’s just one more way to keep our kids safe. And oh by the way, when I say that most girls don’t know how to head a ball properly, I’m not implying that most boys do. Boys may be just as uneducated as girls, it’s just that I’ve rarely watched a boys game over the past two decades. I hope you’ll forgive me.